This report from the University of California’s Climate Change and Business Research Initiative tells California how to put its money where its mouth is. 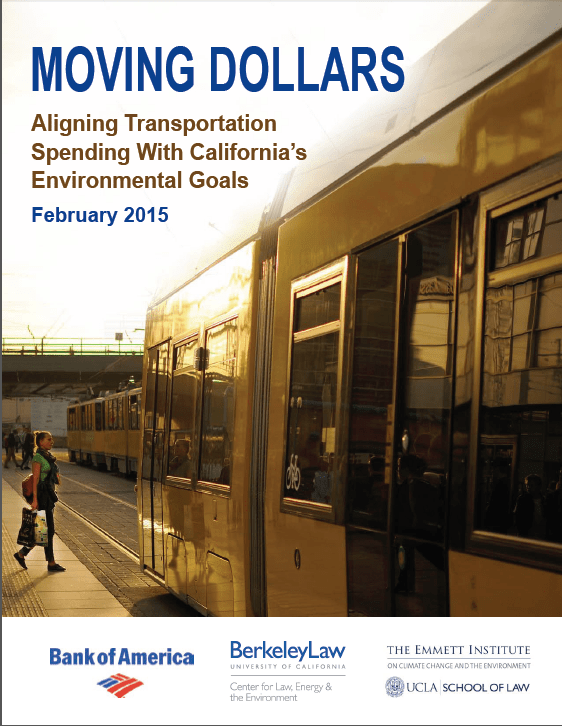 A new report [PDF] offers suggestions for ways that California could better spend the roughly $28 billion it invests in transportation every year, both to be more cost-effective and to better align with the state’s environmental goals. Authored by researchers at the Climate Change and Business Research Initiative, a partnership between the law schools at UCLA and UC Berkeley, the report stemmed from a day-long workshop last fall with a group of California policy makers, transportation experts, and advocates that included some of the top minds in the industry. Develop state project performance standards to make sure that new transportation projects align with state environmental and energy goals. There are some good models already in existence, including the project performance analysis for Plan Bay Area, which scores projects on things like integrating land use and transportation as well as cost-benefit ratios. Lower the current 2/3 voter threshold for local transportation funding measures, and tying the measures to metrics related to environmental goals. Fix existing infrastructure before building new roads–and make sure that repairs and maintenance include safety for all road users, not just people driving cars. Require local governments to reduce parking requirements in transit-intensive areas to give developers room to meet actual parking demand more cost-effectively while reducing the cost of transit-oriented projects. Develop mileage-based user fees for transportation funding in place of the shrinking gas tax, which decreasingly reflects actual road usage as vehicles become more fuel efficient. Amend Article XIX of the California Constitution, which restricts the use of state gas tax funds for transit operations. Certainly, as Angie Schmitt pointed out recently on Streetsblog USA, we could do a much better job spending our transportation funds if we didn’t keep spending them on large new projects and putting off other priorities like maintenance–contributing to the current much-decried shortages in transportation funding, both statewide and across the nation. Some of the report’s recommendations are already in the works, sort of: the California legislature passed S.B. 1077 last fall to study the possibility of creating a pilot road user charge, for example. But some of these ideas, like amending the constitution, could be harder to implement. Bottom line: between conflicting policies and lack of coordination among agencies, California’s transportation dollars are not always spent in alignment with state priorities and environmental goals. This document could be a cheat sheet for policy makers who want to improve state funding rules and find more efficient ways to reach state goals. The recommendations are very comprehensive for moving forward. I think it’s especially important for the Legislature to consider Transportation Network Companies as a first mile / last mile solution to connect with fixed guideway transit if they seek to clarify TNC regulations. I think by far the most important things in this report are the funding reforms. Money is everything. A state Shoup Act would also be great. The one big thing it’s missing is a requirement for municipalities to align their land use regulation with state GHG and VMT reduction targets. Yes! But it seems like the larger issue is that we have a planning process that favors letting NIMBYs derail every single project that comes along. Report: California Leads Nation in Green Transpo Policies.